Media Management is not a widely taught subject but is an important skill to master especially if you are managing multiple projects on a single editing system. Even with large storage capacity at some stage, you will have to delete material! This post looks at the basics of deleting media from within Media Composer (or Symphony) we have other posts that look at managing content while ingesting which also helps maintain a tidy system, which in turn means a responsive editing system. Deleting media is relatively straightforward within Media Composer. You can delete material directly from your bin by simply selecting a clip and pressing the Delete key on your keyboard. You're then presented with the Deletion window asking what you would like to delete the master clip, its associated media files, or indeed both. 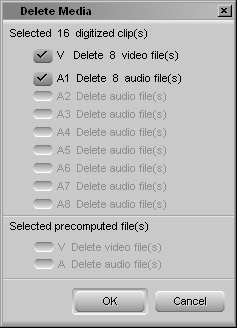 Choosing Master clip(s) (shown top left) simply deletes the clip information from the bin, but keeps the media (pictures and sound) on the drive. Note that if you have entered custom data for the clip this will be lost for that particular clip. Choosing 'Delete associated media file(s)' in the Delete window and not the Master Clip (not shown) means that the actual video and/or audio files will be deleted, meaning you are freeing up drive space without losing any the Master Clip information. 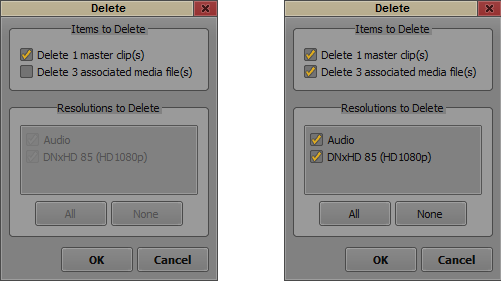 Deleting both the master clip and its associated media files (top right) means that both the master clip held in the bin and the video essence held on the media drive will be deleted from the system. NOTE: When Avid deletes media is deleted straight away and is irrecoverable. It is NOT placed in the trash. Clip information and sequences may be retrievable from the Avid Attic, but may not represent the current state depending on when the last bin save was made. This is why backing up your project is recommended to help save guard against accidental deletion. When purging media from a project deleting media by going through all your bins is not effective or desirable. For this sort of deleting you will need to delete via the Media tool. The Media tool also allows you to carry out further functions as well. Delete all of the media files that have been created in a specific project or sequence. Delete media files for specific tracks associated with a master clip. Search for specific media types such as precomputes (renders) or AMA-linked files. 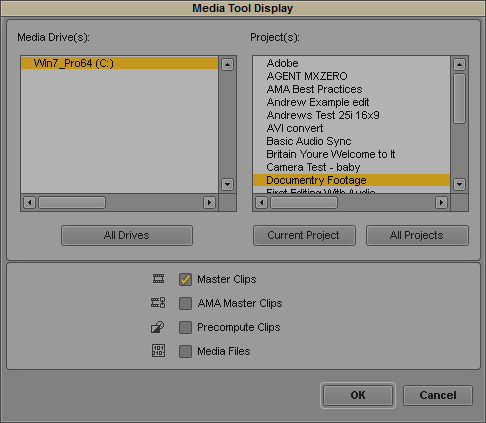 Select Media Tool from the Tools menu to see the selection window. The Media Drive list to the top left is a list of drives that are currently attached to the workstation and have Avid Media available to them. The right-hand Project(s) window presents a list of the Projects that media has been created in, this data is established from metadata within the clips that are then fed into the databases files. These two windows allow you to search on a specific drive for media from a specific project. NOTE: Precomutes are worthwhile deleting on long-running projects to ensure the file count is kept low in media folders and the system remains more responsive. In the case of the above grab, we will be inspecting the drive named Win7_Pro64 and search for Master Clips that were created in the project Documentary Footage. Press the OK button at the bottom of the window to start a search for files that meet your search criteria. Highlight all the clips in the Media Tool search results bin (if you indeed wish to delete all the Master clips from your project) and press Delete at the bottom of the page. Select what files types you want to delete. For example video only or audio only or both. Press OK to confirm the deletions and the media files are deleted from your drive. The master clips, however, remain stored in their original bins within the Project. It's a simple as that. In Part II we will look at relinking media, media databases and looking at how we can delete, material that is not in use in our master edit sequence.